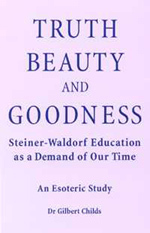 Rudolf Steiner argued that the primary function of education is to exercise pupils' faculties of thinking, feeling and willing. These basic human qualities manifest in civilization as the "eternal verities" of truth, beauty and goodness, and these in turn in science, art and religion. Gilbert Childs' aim in this carefully crafted book is twofold: to illustrate the practical application of the above nine factors, and to substantiate the assertion by Rudolf Steiner that his philosophy and practice of education arose as a demand of the age in which we are living. The author's presentation provides stimulating thoughts for teachers and students of education, as well as anybody interested in esoteric science. GILBERT CHILDS attended the Steiner teacher training course at Michael Hall after war service. He later studied at four universities, his doctoral thesis being entitled "Steiner Education as Historical Necessity". After teaching at State and Steiner schools he spent twenty years as a tutor in a further education college for severely physically disabled students. He is, in retirement, a full-time author and keen gardener. His published works include Understand YOUR Temperament!, The Journey Continues... and Your Reincarnating Child.